Cleaning your rubber roof does not have to be one of those dreaded chores that you worry about having to do for days and weeks before you force yourself to finally do it. Of course, you could think like those RVers who justify not doing it at all by saying, “No one sees the roof so why clean it!” Sort of like out of sight, out of mind. But, most of us just grit our teeth and finally get to work. Obviously, cleaning anything takes time and effort. You can, of course, hire someone else to do it for you, or, you can do the job yourself, minimizing your efforts and leaving yourself with enough time left to get in a round of golf or spend some time with nature in a hammock, fishing, time with the kids or grandkids or whatever else excites your fancy. Rubber roofing came to the RV industry after a long history of excellent performance in the commercial roofing industry. Ethylene Propylene Diene Monomer, or EPDM for short, was initially introduced to the Recreational Vehicle industry in the 1980’s as a less expensive alternative to the increasing cost of aluminum. Another of its many advantages is its flexibility during climate and temperature changes. Because EPDM is strong, flexible and very reliable it has become the roofing material of choice for most RV manufacturers. Before discussing how to maintain your rubber roof membrane as quickly and as easily as possible, it would be best to point out some of the EPDM rubber material’s properties and characteristics. Although very durable, the EPDM membrane is thin. You should always avoid low hanging branches and be careful about dragging anything across the roof surface that could easily cut it. If necessary, rubber roof patch kits are available from most RV supply stores. Some manufacturers of EPDM rubber roof use “talc” on the material during the production process. The “talc” is applied to prevent the rubber material from sticking together after the vulcanizing (curing) process. It is also necessary during storage of the roofing material prior to installation on the vehicle. Unless completely removed during the initial cleaning, the powdery residue will eventually work its way down the sides of the vehicle appearing as light white streaks. EPDM rubber roofing is subject to “chalking” as it weathers and ages. In the EPDM manufacturing process, fillers or pigments such as Titanium Dioxide, Zinc or Calcium Carbonate and others are used to give the rubber material its white color. As the rubber ages it begins to react to moisture, heat and sunlight, causing the fillers to come to the surface. These fillers are carried to the surface and appear as white or gray powdery residue. Rain or moisture (morning due) mixes with the fillers and flows down the vehicle forming white streaks. In discussing this with many RVers, we have found that the process usually begins when the roof is 12-18 months old. However, this is only an average and does vary from roof to roof and climate to climate. In some cases, it can be severe at first and then subside over time. Chalking occurs as a natural process and is not harmful to the material. As seen in the adjacent ” Report of Analysis,” an independent laboratory, S & N Labs, Santa Ana, CA, analyzed the chalky residue collected from a rubber roof to determine its composition. 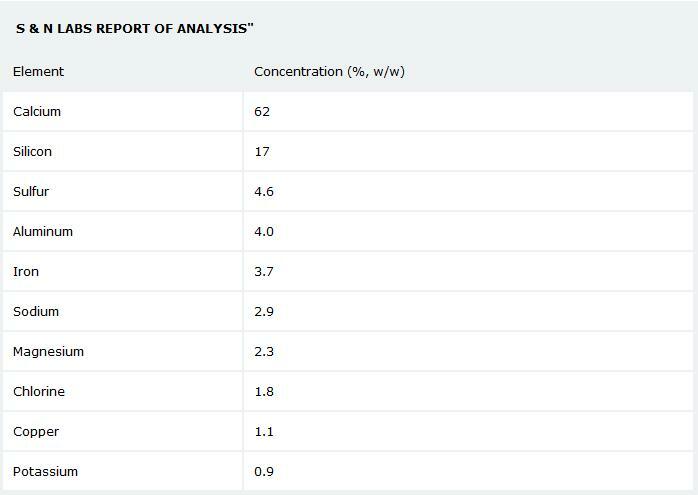 The result of their test (x-ray spectroscopy) indicated high levels of fillers (pigments), 62% calcium and 17% silicon, along with traces of several different elements found in dirt and air contaminates that settle on the roof surface. The amount of chalking and the content of the chalk will vary. Chalking amounts will depend mostly on climate conditions and the membrane’s response to moisture, heat, sunlight and care. Content of the chalk will change depending on the selections of pigments made by the manufacturer of the membrane. Most streaks can be easily removed with a good cleaner. For tougher stains on fiberglass and aluminum side panels, use a quality polishing compound or oxidation removal product like Protect All Fiberglass Oxidation Remover & Color Restorer. Of course the best thing is to prevent the chalking and streaking process altogether. A good rubber roof treatment can retard this process and minimize maintenance. You will be able to do this by using the maintenance method described later in this discussion. An unsightly stain that may appear on a rubber roof in the form of dark spots or broad areas of various colors, is the result of mold and mildew growth. Black and gray are the most common colors of this stain, but it can also appear in lighter colors such as pink, yellow or purple. You may find these spots on your rubber roof in small clusters or in more extreme cases covering the entire roof. A white color is chosen for most rubber roofs not only because it is aesthetically pleasing, but more importantly because it reflects sunlight and heat more efficiently than darker colors. The unfortunate side of white is that it does not absorb enough heat to generate surface temperatures above 126 degrees. Therefore, the EPDM rubber roofing material will never reach a temperature hot enough to kill this fungal invasion. Since the late 60’s, we have known that this phenomena is not a plant or an animal. Mold and mildew is in fact a fungi, or fungal microorganism. The spots themselves are a byproduct of the fugal digestion process. These organisms are ubiquitous; they are everywhere, spreading their spores on the wind. Since this type of growth forms easiest in the presence of moisture, the spots appear to be more common in wet and humid climates. Here the roof becomes a hospitable living environment. Plenty of water and warmth and the spores take hold. Food is the last missing component in the equation of these spots. Dr. James Kimbrough and Dr. Virginia Peart of the University of Florida have studied these fungi and presented a graphical summary of the elements needed for mildew growth. To have a mildew problem, four elements are needed. This is referred to as the Mildew Square. In order for mildew to proliferate, spores, food, warmth and water must be present. The EPDM and/or TPO roof left dirty and damp is a perfect host. Microorganisms require a source of energy, carbon for cell structure, nitrogen for amino acid synthesis, essential minerals and water. Eliminate one of these elements and the square is broken, the mildew problem is eliminated. Unfortunately the unsightly spots are not. With some effort and a good cleaner, you may be fortunate enough to remove some of these stains but most will never come off the roof, no matter how hard you try. 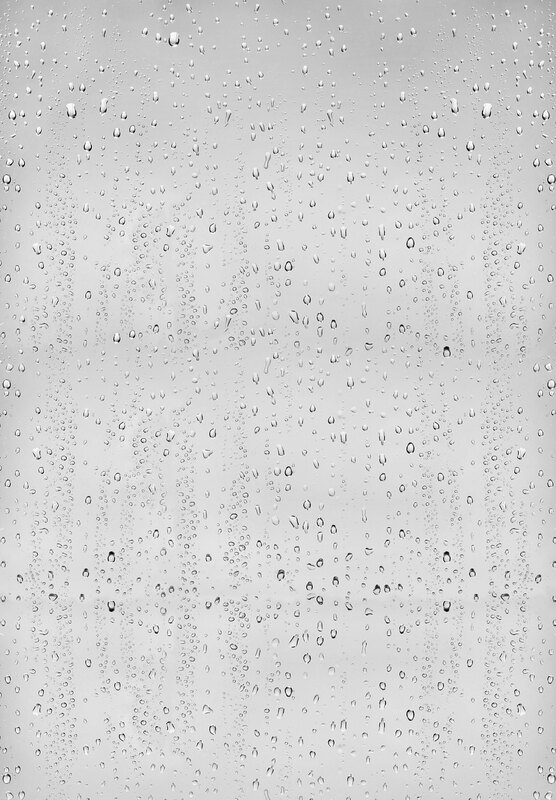 One recommendation from within the industry is to use a solution of bleach and water. Our tests and comments from many RVer’s indicate that this cleaning method is most often unsuccessful. In searching for alternative methods and chemicals to clean stubborn stains on EPDM rubber, we found that DICOR, supplier of the BRITE-PLY EPDM roofing, in their internet Web site information obtained April 2, 1999, under “Roofing Applications,” recommended the careful use of petroleum distillates Xylene, Toluene or Mineral Spirits. Although these are good cleaners, they do not remove mold and mildew spots with any consistent success. If you decide to try using these distillates, do not soak the surface. Dampen a rag with the distillate and wipe the stain. Breaking the Mildew Square is the best measure of preventing the fungus growth. Since it is not feasible to physically dry your roof every time if gets wet from rain, morning dew or humidity, the next best method of breaking the Mildew Square is to eliminate spores, food and warmth, the other three essential needs of mold and mildew growth. Keeping the EPDM rubber roof material as clean as possible will help to accomplish this. 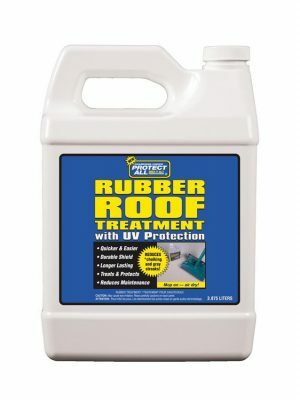 Start by thoroughly cleaning and treating your rubber roof three to four times a year with Protect All’s Rubber Roof Cleaner and Rubber Roof Treatment. In addition to helping to retard the chalking process described earlier in this article, Protect All Rubber Roof Treatment aids in keeping dust, pollen and other airborne contaminates that settle on the roof, from sticking to the rubber surface. Then, every week or two, you should sweep the roof free of all residue that has settled on the roof. This process will temporarily eliminate the spores, food and the dusty environment that captures moistures and feeds the growth and accumulation of mold and mildew. As the roof continues to accumulate air-born contaminates, the Mildew Square again begins to develop, so frequent sweeping is important for effective preventative maintenance. 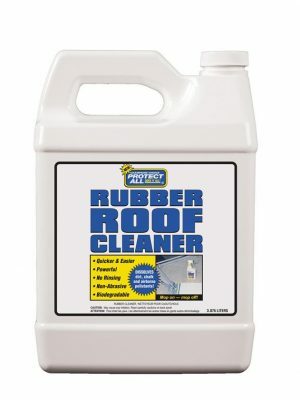 How often you need to sweep off your roof will be dictated by both your seasonal and living environment such as exposure to moisture from rain, morning dew, fog and snow and airborne contaminates such as dust, sand, trees, smog and even your proximity to freeway traffic and airports that emit large amounts of pollutants. Rinsing the residue off the roof with water is not recommended for two reasons; moisture is one of the four elements required to establish the mildew square and the dirty water will create additional clean-up of the sidewalls and windows of your RV. Sweeping regularly is less time consuming and requires less effort than washing your roof and your RV. Thus, you won’t mind doing it more often. It is important to note that although the dark spotting is unsightly, the growth and spread of mold and mildew does not harm the integrity of the roof. A side benefit of keeping your rubber roof clean will be the reduction, or if you are really diligent, elimination of, the dreaded black streaks!